The Observers played a significant role in the later part of season three, setting up events in an experiment to determine if Walter would be willing to let go of Peter. The producers have stated that they will play a significant role in season four. Bits and pieces about “The Observer” (September) were dropped in The Arrival, The Road Not Taken, and There is More Than One of Everything. In the second season, the Fringe team finds out that there is more than one of everything… including Observers. And that they do more than Observe. As August waited for Christine Hollis, there were several things of note. Of particular interest was the black notebook that he used to take notes in a strange, cryptic language. He was taken aback when a veteran engaged him in friendly conversation, starting with a compliment concerning his binocular-like gadget. He told the veteran that the object is “from far way.” With as little as we still know about the Observers, what does this mean? Far is word for a measure of distance. Or does August just use this as simple explanation for an idea that is very complicated? The veteran gave him a flag pin, and August looked like he did’t know what to make of a kind gesture. Humans and our quirks must have been interesting to him. In physics, there is a well-known principle called the “observer effect.” This states that the results of an experiment are affected by the act of observation. So, while the Observers claim to not get involved, they still can change events by merely watching. This was taken to the literal extreme when September interrupted Walternate, keeping him from seeing that he was successful in finding a cure for his dying son. Hence, a whole new chain of events was started. In this episode, August left his notebook on a park bench, knowing that Walter Bishop would eventually break the code and help him. Thus, setting a new path into motion. The Observers have weapons, which means that they get involved more often then they’d like, I’m sure. As a security guard fired his weapon, it didn’t seem to phase August, and we later learn that he caught the bullets in mid-air. September was able to do this in The Firefly. Both can start vehicles using electrical impulses from their fingers. The Observers appear to be able to slightly bend the laws of physics. While investigating, Olivia and Peter enlist the help of Massive Dynamic’s Brandon Fayette, who happens to have a geeky interest in the Observer’s appearances and the origin of their writing. He explains the fluid nature of time; how everything occurs at once. Yet the Observers can sit back and watch it at any point. But time is not linear in one direction, it branches like a tree with new possibilities for every new decision path. Various possible futures are happening simultaneously. I can tell you all of them, but I cannot tell you which one of them will come to pass. Because every action causes ripples, consequences both obvious and... unforeseen. After all these years, August kept Christine’s teddy bear. Just like Walter kept his Peter’s silver coin. A reminder of someone they love. Humans use physical objects in order to help them remember. Walter even used food in order to jog his memories and make connections. For instance, Walter was on a quest for the perfect strawberry milkshake in this episode. But after season 3, there is no reminder of Peter. As far as we know, anyway. However, Walter once called the human brain an amazing organ, and it never forgets experiences. When Olivia was trapped Over There in The Plateau, her projection of Peter told her that he was a part of her that she had to hold on to. That she could not forget him. Walter also said that if anything went wrong when Peter chose to go back to our current time with knowledge of the future, that Olivia would be their fail safe. I’m counting on one or the other to “remember” Peter somehow in season 4. As a fan of Dune, I’d like to think that memory transcends life-times. So maybe it can transverse time-lines as well. Peter asked about Christine Hollis: “What is so special about her? Why save her?" Olivia also found nothing “special about her” when she was reviewing information about the girl. One could ask what is so special about Olivia? To Peter, she was his everything. August explained that he had observed Christine for all of her life, and that she was unique. At the Asian restaurant in the episode, September reminded August that humans “are all unique.” This fact alone was not enough to keep her from her fate, that she was meant to die in an airplane crash. Is there a difference between “special” and “important?” The Observers might say that they see no future for someone, but one change in a decision from someone else could alter things toward a new outcome. It could cause those ripples that September spoke about. In The Plateau, we saw Milo Stanfield literally get away with murder, as he set up a string of events that just seemed random. But Olivia acted in a manner that he did account for in his calculations. Peter had remarked early in season one that random events happen all the time that seem linked, but that doesn’t mean that there is any significance to them. Then he changed his tune by the time of The Arrival. One could say that Olivia had no future when she was killed, but Peter would not accept that fate. Well, in that case, if you cannot persuade the others of your conviction, then you must do something to prove it. You must make her important. And of course whatever you do, you must be prepared to face the consequences. Walter’s consequences were the destruction of two universes, plus the pain of watching his son crumble. August’s consequence was dying for a woman that he fell in love with. September said,“You made her important. She is responsible for the death of one of us." Peter’s consequence was to erase himself from existence so that his love, Olivia, would live. 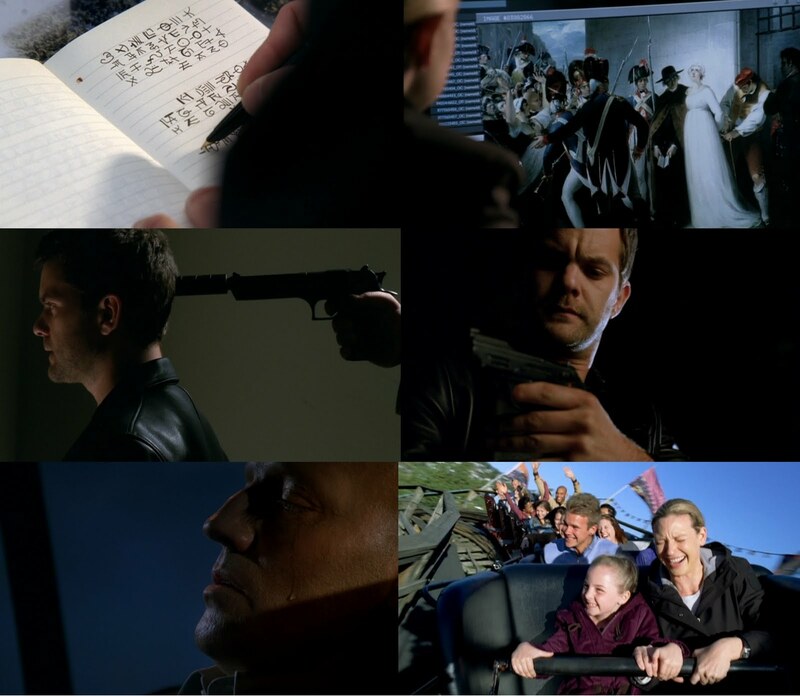 All of this falls nicely into one of Fringe’s core themes: How far would you go to save someone you love? August made it a point to hand Peter his gun, and it appeared as if he communicated telepathically to Peter. Peter was astounded that he was able to fire the weapon. Peter once stated that he could “bring anything mechanical back from the dead.” Is his ability to easily use and fix technology more than just because of his IQ? Peter asked Walter if the Observer ever told him why he saved them both. Walter’s face suggested that he knew more than he was telling. Of course, Peter did not know where he came from at this point. At some point, Walter must have spoken in detail with September. We do know that Walter was warned to never allow Peter to return to the other side. Did Walter know why? Walter also begged August when they met to not take his son. Over several interactions with Observers, Walter is very frightened about them taking Peter from him. He told August that he had made “an arrangement” with September. Did he tell Walter that his time with Peter was limited? Peter: They have the answers. I know they do. Walter: Don't worry, son. You will get your answer. So maybe in Season 4, we’ll finally get the answer Peter has been seeking. It was nice to see Olivia laughing and trying to live a normal life, as she took care of her niece, Ella. Ella was not afraid of roller-coasters, and she giggled because her brave aunt was frightened of them. When they had to put their plans on hold, Ella said, “It’s OK, Aunt Liv. I know that you have an important job.” I never would have guessed that Ella would be doing that job in the future, and that she’d be one of the First People. It is a shame things are going to get so hard for her. Just as Olivia went out on a limb and went out of her comfort zone, everything went crazy. Metaphorically, Olivia’s life became an emotional roller-coaster from this point out. In Grey Matters, she found that she had become very attached to the Bishops. In What Lies Below, I think we get the first glimpse of the fact that she had confused feelings for Peter, as she was shaken-up over the thought of him dying from the virus. The discovery of her ability to see objects from the other side in Jacksonville, led to her seeing Peter glimmer, and to hearing Walter’s story of his grand deception in Peter. Then she had the terrible secret she was keeping from Peter, which he found out any way, and he left this universe in a hurt and confused state of mind. So now, we get to see life without the ripples caused by Peter. Will it be better? Maybe in some ways. But I have a feeling life without Peter will be much worse than the future we saw in The Day We Died. Where are the Observers from, and why do they care about events in the world, but distance themselves from individual humans? Why could Walter decipher the Observer’s language? Just how much does Walter know about the Observers and their plan for Peter? Why can Peter use the Observer’s gun? Who was Donald Long? He did not appear to be an Observer, but he had some interesting capabilities, especially when he found August’s hotel hideout in the phonebook. August was emboldened by Walter’s act of love in saving Peter. Without Peter, he probably wouldn’t have tried to save Christine Hollis. Donald Long may have killed Olivia since Peter would not have been there to stop him. I love the re-caps. One thing to think about going forward is that when Peter does return, he will "not be the peter we've grown (or the 2 Olivia's)to love. He will be different . . . " this what John Noble said in a recent interview. Maybe he will work with the ZFT people or work for Massive Dynamic. I have a feeling he will initially be on the opposing side of Olivia, Walter and the Fringe team. -Do the Observers observe everyone or just certain people? -Does Walter know all the Observers? -Olivia: “I’m scared of the roller coasters.” At the end of the episode she is riding one with Ella. Did Ella convince her to give it a try or did Olivia decide to give it a try? We know from 3.03 The Plateau that Fauxlivia rode one with Alt-Charlie. He was testing her memory. In 3.05 Amber 31422 just before Olivia goes in the tank for the first time she says: “Just like riding the roller coaster at Coney Island, right? “ Also in 3.19 LSD as cartoon Walter, Peter and Bell are on the roof, looking down, there is a roller coaster in the landscape of Olivia’s mind. -It’s amazing how different Olivia is when she’s with Ella. Ella brings out the best in Olivia, smiling and laughing. Ella is very understanding about Olivia’s job. And I still think there is more to Ella than what we see. -Pancakes are a Bishop’s favorite as well. -Why is Walter recreating strawberry milkshakes? In 3.10 The Firefly he says he spend six years perfecting the recipe. -I miss August. To me he was the most human one. It was good to see him again in 2.15 Peter, although in a sense that was before he died. Is he the only one that developed feelings for those he watches? Is it not allowed? -Olivia to Broyles: “…everything we know about these guys, the little there is suggests that they just watch. They don’t get involved. But now…” I think the Observers are more involved than they want to admit. And for what purpose? -In the Observer’s book is a symbol of a circle with dots around it. You can see it best when Peter is showing Walter the stain (fringefiles 250 in screenshots for 2.08 August). The symbol appears also on a graffiti in 3.10 The Firefly when Peter just steps through the door to come on to the roof (fringefiles 742 in the screenshots for that episode). -Peter to Walter: “Did he ever tell you why he saved us?” Walter’s expression suggests otherwise but we have not been told. -How did Walter find out that this is a code? -How did Massive Dynamic get a copy of the book? -And why does Brandon spill water on Olivia’s boots, twice? -26 sightings in 3 months. That goes back to 1.19 The Road Not Taken when Nina shows up at Broyles’s house quite concerned. What’s going to happen because he shows up so often? -How did the Observers get their names? -August created an irregularity that needs to be corrected. Hm. -Allston: Peter’s mom moved to an apartment in Allston, after Walter was locked up (1.03 Ghost Network), David Robert Jones had leased a warehouse in Allston (1.14 Ability) and Peter and Olivia took a car trip to a warehouse in Allston in 3.16 Os. -The shot of Olivia in the car where she does the thing with her mouth was used again in 3.20 6:02 AM EST as she’s driving to see Nina. -Still want to know what happened to Olivia’s mom. -I think it’s funny that September argues with August about getting involved since he is the one who pulled Peter and Walter out of the lake. -December says: “your perception must be in error.” I thought the Observers know all the different choices that can be made; they just don’t know which one. Is August’s perception then not a valid one? Not sure if I’m making sense. -Walter: “Please don’t take my son. Your friend and I had a deal.” What was that deal, Walter? -The outlet in the apartment has 4 holes. -Walter: “And of course whatever you do, you must face the consequences.” Walter says something similar to Alistair Peck in 2.17 White Tulip. -The Observer sacrificed himself for Christine. So they can die. -Why was Peter able to fire that gun? -How does Walter know that Christine is safe now? -“Look how happy she is. It’s a shame things are about to get so hard for her.” I think it’s been hard for Olivia already, going back to her childhood, being experimented on as a child, the step father, her mom dying when she was 14, John dying, Charlie dying and being betrayed by them, and kidnapped. I had no idea how much harder it could get. Going to another universe, being trapped there, experimented on some more, coming back realizing Peter’s been with her doppelganger, realizing who she really is and what she can do, losing Peter again and on and on. Wow. -Olivia would have been killed by Donald, either earlier in the apartment or at the motel and she would have never found Christine. Actually Olivia wouldn’t have made it in a lot of episodes. As strong as she is and as much as she can defend herself, Peter saved her quite often. -would Olivia have shared the memory of her mom with someone else? It has been brought up a few times in articles on the net that the scene of August having his epiphany in the back seat as he dies, while September drives-the tear sliding down August's cheek, is so VERY reminiscent of the android Roy talking of his ability to have feelings as a tear slid down his face as he died in the 1980's flick "Blade Runner." This is a must-see scifi movie, if you've never seen it. The book that inspired the movie "Blade Runner" is called "Do Androids Dream Of Electric Sheep?" If that sounds familiar, the title for episode 304 of Fringe "Do Shapeshifters Dream Of Electric Sheep" is a play on the book's title. In "The Friefly" Roscoe Joyce says "My knowledge of science begins and ends with inventing a recipe for a ...strawberry milkshake." Did anyone mention the Green, Green, Green, Red dots that showed up on the observers "phone" when they dialed the assasin? Just like from the episode "The Equation"